The QPhoneStyle class provides a phone look and feel. 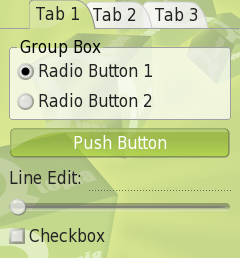 This style is Qtopia's default GUI style for Qtopia Phone Edition. To write a customized style for Qtopia Phone it is recommended that QPhoneStyle be subclassed. QPhoneStyle provides improved display for widgets in edit and navigation mode. It also applies the global background to Qtopia widgets. This enum describes the extra style hints available for QPhoneStyle and derived classes. A style hint is a general look and/or feel hint. QPhoneStyle::SH_ExtendedFocusHighlight 0x10000000+1 A boolean indicating whether the widget with focus should have an extended highlight. The extended highlight will highlight any labels associated with that widget along with the widget itself. QPhoneStyle::SH_PopupShadows ? A boolean indicating whether popups (widgets with flag Qt::Popup) should have a shadow. QPhoneStyle::SH_HideMenuIcons ? A boolean indicating whether menus should hide any icons associated with menu items. QPhoneStyle::SH_FullWidthMenu ? A boolean indicating whether the context menu should extend to the full width of the screen. QPhoneStyle::SH_ScrollbarLineStepButtons ? A boolean indicating whether scrollbars should display scroll arrows at the ends. QPhoneStyle::SH_FormLayoutWrapPolicy QStyle::SH_Menu_Mask + 5 Provides a default for how rows are wrapped in a QFormLayout. This enum value has been deprecated in favor of QStyle::SH_FormLayoutWrapPolicy in Qt/4.4. Returns a QFormLayout::RowWrapPolicy enum. QPhoneStyle::SH_FormLayoutFieldGrowthPolicy QStyle::SH_Menu_Mask + 8 Provides a default for how fields can grow in a QFormLayout. This enum value has been deprecated in favor of QStyle::SH_FormLayoutFieldGrowthPolicy in Qt/4.4. Returns a QFormLayout::FieldGrowthPolicy enum. QPhoneStyle::SH_FormLayoutFormAlignment ? Provides a default for how a QFormLayout aligns its contents within the available space. This enum value has been deprecated in favor of QStyle::SH_FormLayoutFormAlignment in Qt/4.4. Returns a Qt::Alignment enum. QPhoneStyle::SH_FormLayoutLabelAlignment ? Provides a default for how a QFormLayout aligns labels within the available space. This enum value has been deprecated in favor of QStyle::SH_FormLayoutLabelAlignment in Qt/4.4. Returns a Qt::Alignment enum.